Inhaled corticosteroids (ICS), also known as inhaled steroids, are the most potent anti-inflammatory controller medications available today for asthma control and are used to decrease the frequency and severity of asthma symptoms. They are the current mainstay of treatment once a person with asthma needs a higher level of care than a rescue inhaler (bronchodilator). You use rescue β-agonist treatments, such as Albuterol, more than two days per week. You have asthma symptoms more than twice weekly. You meet certain criteria on spirometry. Your asthma interferes with your daily activities. You have needed oral steroids two or more times in the last year. Commonly inhaled corticosteroids or combination drugs that contain a steroid include the following. Which may be best for you depends on several factors, including the severity of your asthma and your overall health. Metered dose inhalers (MDIs): These consist of a pressurized canister containing medication that fits into a plastic mouthpiece; a propellant spray helps deliver the medication into the lungs. Chlorofluorocarbons (CFCs) were used as a propellant until 2008 when the FDA banned them due to environmental concerns. They were replaced by hydrofluoroalkanes (HFAs), which remain in use today. Dry powder inhalers (DPIs): With these, no propellant is involved. Instead, the medication is in the form of a dry powder, which you release by breathing in a deep, fast breath. Nebulizer: Nebulizers turn liquid medicine into a mist. They come in electric or battery-run versions with either a mouthpiece or a mask. Inhaled corticosteroids prevent asthma symptoms by reducing inflammation in the bronchial tubes, or airways, that carry oxygen to the lungs. In addition, they reduce the amount of mucus produced by the bronchial tubes. This is achieved by blocking the late-phase immune reaction to an allergen, decreasing airway hyperresponsiveness and inflammation, and inhibiting inflammatory cells such as mast cells, eosinophils, and basophils. Inhaled steroids are a key part of asthma control for many. Some assume these drugs are the same as anabolic steroids used by some athletes and that they carry the same significant risks. Rest assured that these drugs are different. Generally, inhaled corticosteroids are used for long-term treatment of asthma in people of all ages who require daily management. They are effective in preventing asthma attacks but require daily use in regularly spaced doses in order to be effective. In addition, they may not be effective for up to six weeks after you begin using inhaled corticosteroids, and several months of regular use may be required to reap the full effects. Since inhaled corticosteroids act locally in the airway, minuscule amounts of the medicine make its way into the rest of the body. Therefore, the risk of potentially serious side effects commonly experienced by people taking systemic steroid medications is significantly lower. Overall, the risks associated with inhaled corticosteroids are very low, but there are several things you can do to mitigate them. Thrush (oral candidiasis) is one of the most common side effects of ICS, affecting up to a third of patients. It almost always seems to occur as a result of ICS being delivered to the side of the mouth and throat, making proper administration technique very important. Lowering the dosage, using a spacer (a chamber inserted between the inhaler and your mouth), and appropriately rinsing your mouth following inhalation all help lower your risk of thrush. Thrush can also be treated with topical or oral antifungals, such as nystatin. Dysphonia: Inhaled steroids can affect your voice, a phenomenon known as dysphonia. It may be prevented by using a spacer and treated by decreasing the ICS dose temporarily and giving your vocal cords a rest. Reflex cough and bronchospasm: These side effects can be prevented by using a spacer and inhaling in more slowly. If needed, pretreatment with a rescue inhaler can prevent these symptoms. Poor growth: While poor growth in children can result from inhaled corticosteroid use, poorly controlled asthma can also be a cause. In general, low and medium doses of ICS are potentially associated with small, non-progressive but reversible declines in growth of children. As a result, you and your child's asthma care provider should not only carefully monitor growth, but try to use the lowest possible medication dose that gets good control of your child's condition. You must weigh the potential benefits of good asthma control with the small but real possible side effect of slowed growth. Osteoporosis: Low doses of ICS do not appear to affect bone density, but there are more effects as doses are increased. If you have risk factors for osteoporosis or already have a low bone density, you may want to consider taking calcium and vitamin D supplements or a bone-protecting treatment such as a bisphosphonate (available by prescription; brand names include Boniva and Fosamax). Easy bruising: Bruising and thinning of the skin can occur in patients using inhaled corticosteroids. The effect is dose-dependent, so decreasing the dose may be helpful. Cataracts and glaucoma: Low and medium doses of ICS have not been associated with cataracts in kids, but a cumulative, lifetime effect associated with increased risk of cataracts has been noted in adults. Only patients with a family history of glaucoma appear to have an increased risk of glaucoma with ICS use. As a result, patients on these drugs should have periodic eye exams, especially if they are taking high doses or have a family history of elevated eye pressure. 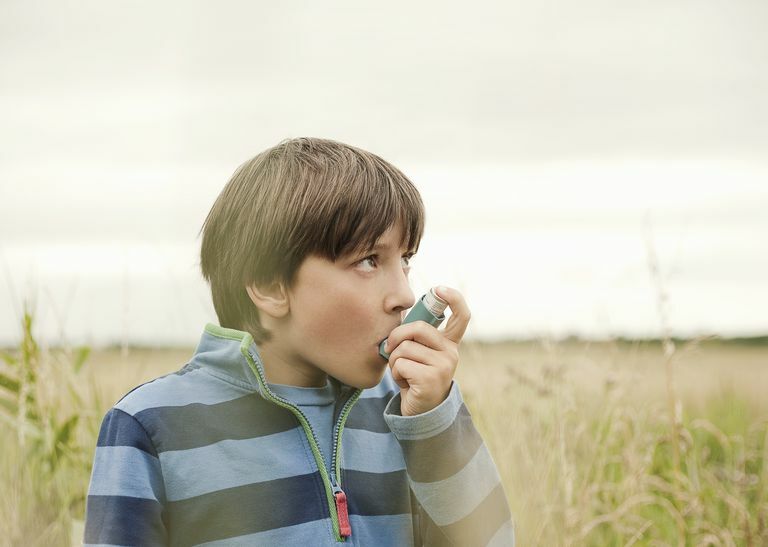 While inhaled corticosteroids improve asthma control more effectively than any other agent used as a single treatment, it is important to note that these drugs cannot relieve an asthma attack already in progress. A rescue inhaler is still needed for those situations. Food and Drug Administration (FDA). Transition from CFC Propelled Albuterol Inhalers to HFA Propelled Albuterol Inhalers: Questions and Answers.